Where to begin in the face of so many mistakes in just one paragraph? Lanner's first name was just Joseph. There is not a single contemporary source that corroborates the additional names "Franz Karl" which only appear on the announcement of the reburial of Lanner's remains on 13 June 1904 in Vienna's Zentralfriedhof. Lanner was not born on 11 April, but on 12 April 1801. The baptismal entry in the records of St. Ulrich proves this and so does his baptismal certificate (based on the same entry) which in 1879 Lanner's daughter, the renowned ballerina Katti Lanner, copied for the Viennese writer Josef Wimmer (1834-1903). 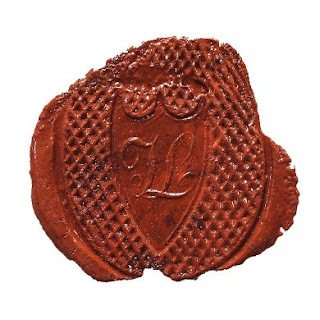 I, the undersigned, herewith certify that by Martin Lanner, I. & R. privileged glove manufacturer living at St. Ulrich No. 10 and his wife Anna, née Scherhauf, both catholic, a son was produced during their marriage who on the twelfth of April in the year one thousand eight hundred and one (12 April 1801), on the day of his birth, received the Christian baptism from the reverend Franz von Salazar, parish cooperator in the presence of Mr. Joseph Stey, glove manufacturer as godfather according to the Christian rite and was given the name Joseph. In witness whereof my personal signature, Vienna St. Ulrich's parish on 26 June 1843, the parish priest Heinrich Münzer. 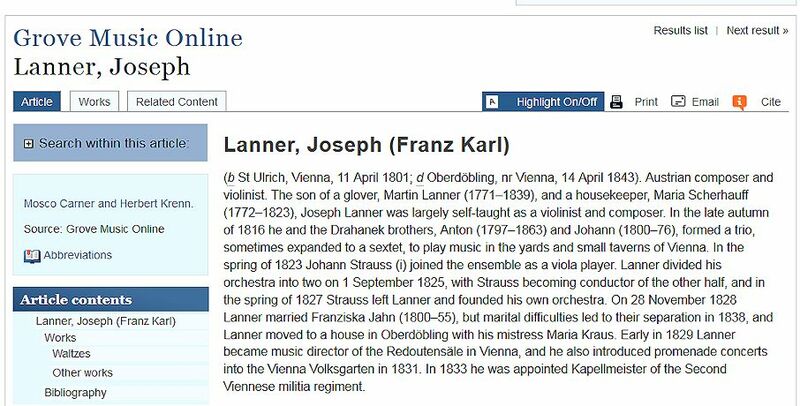 Lanner's wrong date of birth was created by the New Grove article's co-author Herbert Krenn, who, feeling short of new information in his 1992 dissertation on Lanner, decided to create a piece of artificial news concerning the composer's biography. The correct date has been published in print several times, the last time in 2001 by Thomas Aigner. By making up a new date Krenn just wanted to appear much smarter than all his predecessors. The commemorative plaque with Lanner's correct date of birth on his place of birth, the house Mechitaristengasse 5. The New Grove is not afraid to contradict dates that are carved in stone. Joseph Lanner was not "largely self-taught as a violinist". Archival sources suggest that Lanner was a pupil of the violinist and court musician Zeno Menzel (1757-1823). Lanner did not get married on 28 November 1828, but on 24 November of that year. His wife's name was not "Franziska Jahn", but Franziska Jahns. She was not born in 1800, but on 15 September 1799 in the house Laimgrube No. 68 (today the area in front of Linke Wienzeile 48). A section of Franziska Seraphika Jahns's baptismal entry from 15 September 1799 (St. Josef ob der Laimgrube, Tom. 7, fol. 35). The dash above the "n" is a mistake which was corrected in the father's name. Franziska Jahns's godmother was Franziska Perin, née Huber, the wife of Jean Perin, a Paris-born make-up manufacturer. The entry concerning Joseph Lanner's wedding on 28 November 1828 (St. Josef ob der Laimgrube, Tom. 9, fol. 66). Lanner's best man was the owner of the "Sperl" in the Leopoldstadt Johann Georg Scherzer. Lanner's other close friend, the innkeeper Martin Hartl (1788-1835) did not serve as witness, because he knew too much about the groom's premarital love life. It seems that Herbert Krenn misread the date at the upper left of this entry, but the correct date of the wedding also appears in several baptismal entries of Lanner's children. I, the undersigned herewith testify that Mr. August Jahns I. & R. privileged glove manufacturer has been living with his family for 11 years in my house, Laimgrube, Kothgasse At the Red Rooster No. 97 and that during this time his daughter Franziska has never been absent from her parents. These are just the mistakes in the first paragraph of New Grove's current Lanner article. This poses the question: why was Herbert Krenn chosen to write it? One should assume that having written a dissertation about a composer should qualify an author to write a short article about this composer for New Grove. But Krenn got his PhD in musicology in Vienna and – as I have repeatedly pointed out – in Vienna things are a little different. In January 2001, Macy announced a "mission update" concerning the policy for revisions to be posted in April 2001 which never appeared. On 18 September 2002, I told Macy about the most glaring mistakes in The New Grove's Lanner entry, but no correction was made. In 2001 I published a review of Robert Winter's New Grove Schubert article (which is more or less a train wreck) which in 2013 I translated and published on this blog. None of the countless mistakes in Winter's article has so far been corrected. Since I have been asked by the editors to revise my own articles in New Grove, OUP's current policy seems to be that articles can only be revised and corrected by their original authors. In October 2012, I made the offer to completely overhaul Winter's Schubert article, but there is obviously no budget to pay writers for such extensive corrective work and thus the online version of The New Grove is forced to be stuck with flawed material forever. Why should Herbert Krenn ever want to correct his own work? To have his wrong Lanner dates printed, copied and preserved for ages, was why he came up with them in the first place! I have spent years of paid (and much more unpaid) research concerning the biography of Joseph Lanner and can say without arrogance that I know more about this man's life than anybody else. But my research cannot be published, because there is no funding available for such an enterprise in Lanner's hometown. Furthermore there is no medium for this kind of publication. The Wiener Institut für Strauss-Forschung has ceased the publication of its journal and the editors of the "Wiener Geschichtsblätter" have shown themselves not to be trustworthy. © Dr. Michael Lorenz, 2015. All rights reserved.